I’m freshly back from Agent Reboot Phoenix (Diverse Solutions is proudly badge sponsors for the show) and I thought I’d share some tips (more like “Action Steps”) for things you might do to get the most out of the show. I think it was Jay Thompson who said “most of you probably won’t implement the techniques and tools that we’re showing you here today”. This is largely true! Very often, people fail to implement the things they’ve learned at a conference (myself included at times). But today, that’s not going to be the case… Right?! Pick one or two tools or techniques and master them (hat tip to @Nik_Nik who said this). Don’t just say “oh, yeah, I need to start my WordPress blog soon.” Instead, do it. Set it up today. Ask for help if you need it, but DO IT today. Then, get your content calendar in order. If writing isn’t your thing, @DarinPersinger had some good tips on video! The point is, pick one or two things you learned from the show, and execute. What’s working for you RIGHT now? And what can you do better? Attend a few more meetups. Check for upcoming events (meetup.com, Facebook, etc.) and attend a few. Like Sherry Chris said, if you want to be a successful agent, you need to get out from behind your desk and meet people! You can’t do this by hiding behind your desk, laptop and blackberry. Judging by how things went yesterday, you’re all pretty darn social. Start getting more social locally! You’ll gain more visibility and grow your database that way (which is the goal after all). What would YOU add? What was your biggest takeaway yesterday? 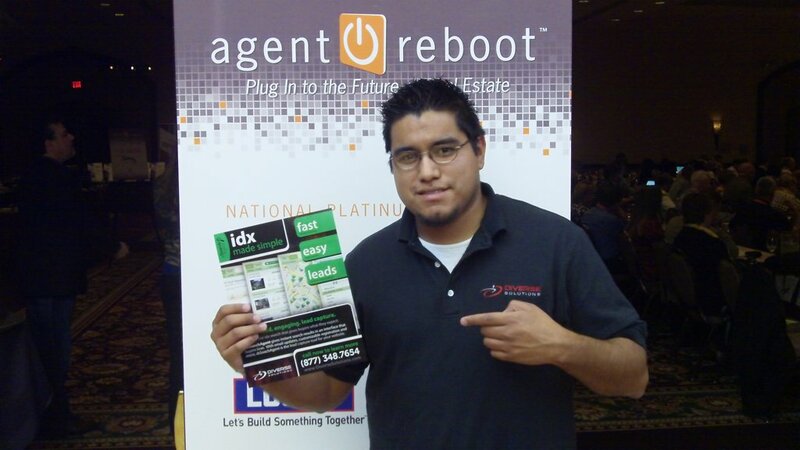 What are you going to work on and what can you implement TODAY to get the most out of your Agent Reboot experience? It was great to connect with people like Michael and Cheron Lange (clients of ours at Diverse Solutions) – we got to spend some quality time at lunch together and I really go to learn about what they were doing with their marketing strategy to build their business in the Phoenix area. I finally got to meet Tiffany Herrmann (also a client) with United Broker’s Group who’s just as passionate and a joy to be around as she is on the phone (we’ve spent countless hours on the phone prior to meeting for the first time yesterday). And I got to connect with folks like Brian D. Culhane, President of exp Realty in Phoenix – they’re a client of ours in the Seattle area and they have plans of taking over Phoenix (and I think we can help). We’ll be at the upcoming events in Orange County (3/30/2011), Dallas (4/13/2011), and Chicago (4/20/2011) and we’re happy to announce that we have two tickets available for each show that we’re giving away… Just head on over and fill out our Agent Reboot Contest Form and consider yourself in the drawing – we look forward to connecting with you!